Preheat oven to 350. Slice yam into rounds, pare away skin then chop into bite sized pieces. Saute chopped yam in 2 T olive oil over medium heat for 3 minutes, adding minced garlic and 1 teaspoon sage and thyme, stirring well to coat yams. Add 2-3 tablespoons water, then cover with lid and reduce heat to medium-low to simmer until yam is soft, checking and stirring every couple minutes. While yam steams, cut away tough outer edges of broccoli, then slice inner stalks into bite sized pieces, also flowerettes. When yam is almost but not yet soft enough, add chopped broccoli stems to steam covered for 3 minutes, then add yellow peppers and broccoli flowerettes to steam covered for 2-3 minutes until peppers and broccoli are bright and just slightly soft. (Or add chopped spinach and 1-2 T water, cover and steam for 2-3 minutes until greens are bright green and slightly soft.) Do not overcook veggies. Remove from heat, keep lid off pan. While vegetables are steaming, place large deep dish pie pan or 9×9 baking dish into preheating oven for a few minutes to heat pan. Also start preparing egg mixture: crack eggs into bowl, add milk, pepper and 1/4 t salt. Whisk well with fork. 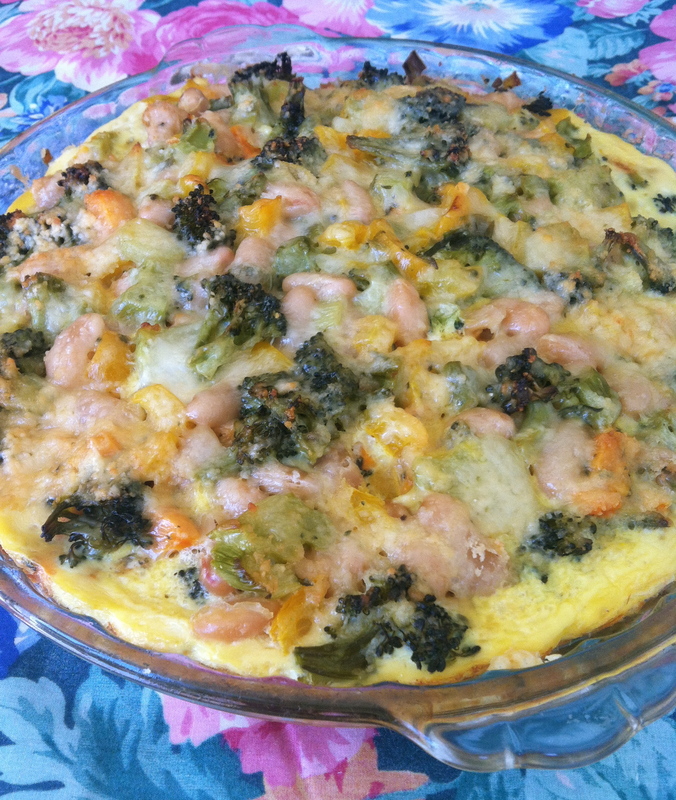 Remove baking dish from oven, thoroughly wipe a little olive oil over bottom and sides of pan (being careful not to burn yourself), then transfer half of yam/yellow pepper/onions/greens mixture into hot baking dish, half of beans, half of cheese, then repeat layers. Pour well-mixed egg mixture over top of veggies, tilting pan to spread egg mixture evenly under veggies too. Last sprinkle half of cheeses generously over top. Bake uncovered for about 25-30 minutes, then do toothpick test for doneness, (depending upon the oven and weather, cover with foil for another 5-10 min or so) baking until edges and top have browned slightly and toothpick comes out clean. I find there may be a little extra water at the edges of the baking dish after cooking, which I just tip slightly to run off into the sink so the frittata isn’t soggy when served. Using 4 eggs, 1 can beans, and 4 oz grated cheese plus Parmesan, this makes 4 dinner size servings each with about 19-20 grams protein. Another combination for a ‘south of the border’ frittata: red potato, yellow or red onion, garlic, red pepper, black beans, tomato and Swiss cheese. Or try mixed red and yellow roasted beats, orange pepper, onion, garlic, the beet greens, walnuts and 4 oz Havarti cheese. Lightly butter 2 quart casserole dish, and preheat oven to 365F. Chop ends off of celery root, then cut away outer tough skin to reveal white root. Cut in half, then cut into 1/8″ quarter round slices. Also cut turnip into 1/8″ quarter round slices. Layer half of celery root around bottom of casserole dish as you would potatoes when making potato au gratin. Next layer half of turnip, half of arugula, half of white kidney beans, half of cheeses; then repeat with layers of celery root, turnip, arugula, beans, all of cauliflower, cheeses. Pour scant 1/4 c milk over all, and top with dots of chopped butter, freshly ground black or green pepper to taste. Bake in center of oven, covered for first 25-30 minutes, then uncovered for about 10-15 more, until nicely browned top crust (but not dried out inside). Revisited: instead of layering in the arugula, I served the baked au gratin on a bed of arugula– I liked that better. This is not your grandmother’s super rich potato au gratin– if that is what you’re craving, then use more Gruyere, cream instead of 1% fat milk, and 2-4T butter. That said, I thought it was totally satisfying– light yet sustaining with the beans adding protein, and the great flavor of the turnip and arugula complementing the Gruyere. What do you think? 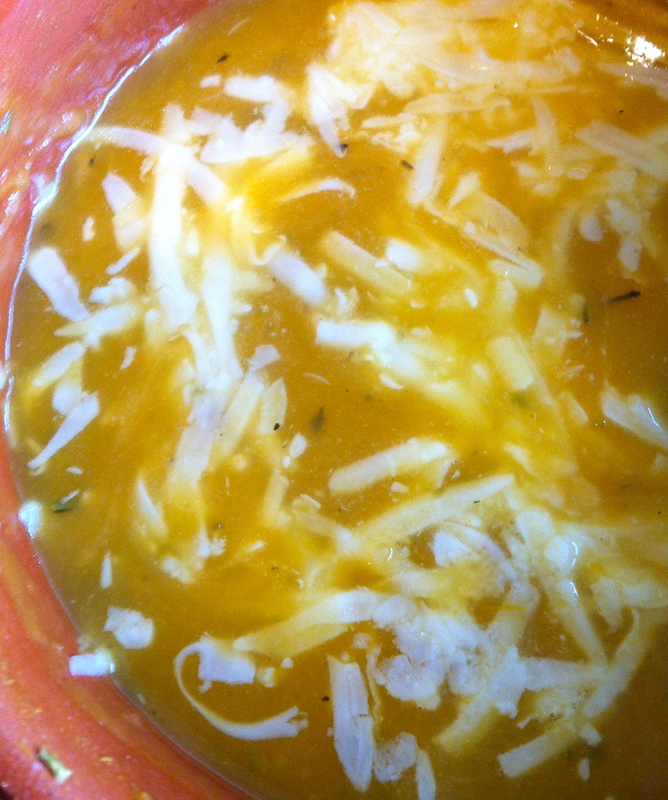 This soup is quick and easy to make. 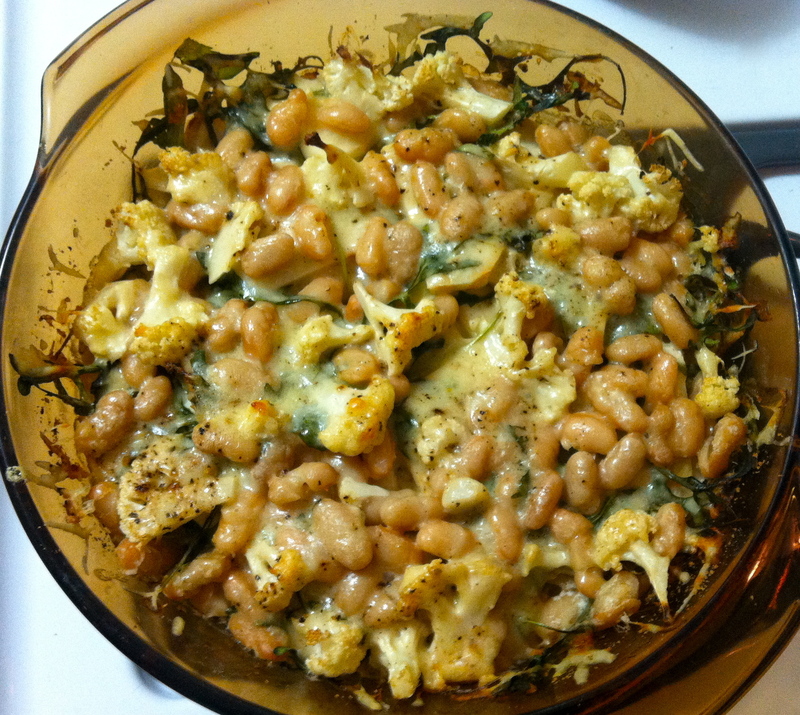 The beans provide both protein and fiber, and the melted Toscano pepper cheese turns it into fabulous comfort food. Pour 2-3 T olive oil into large soup pot. Slice yam into 1/4 inch rounds, peel away skin then cube. Chop butternut into 1/4 inch half rounds, remove skin then cube. Chop onion. Transfer these to soup pot to saute for 3-5 minutes, adding minced garlic and spices. Bring 1 cup water to boil, dissolve vegetable bouillon cube. Add to soup pot, cover, reduce heat and simmer until squash and yam are soft to fork test, about 10-15 minutes. Blend smooth using an immersion blender, or remove from heat and allow to cool before blending smooth in blender. Return to soup tureen, add drained and well rinsed white kidney beans. Serve topped with grated Toscano black pepper cheese.